The IMF measures the debts of all levels of government as the national debt. In the case of Israel, this calculation arrived at a debt to GDP ratio of 61% at the end of 2017. This figure is termed “gross debt.” The IMF also calculates the “net debt” of Israel. This is the total amount of government debt, minus the financial assets of the government. At the end of 2017, the IMF-calculated net debt of Israel worked out at 58% of GDP. The OECD also includes debts of public-sector agencies in its national debt figure. By the OECD measure, Israel’s national debt as a percentage of the country’s GDP was 75.8% at the end of 2016. 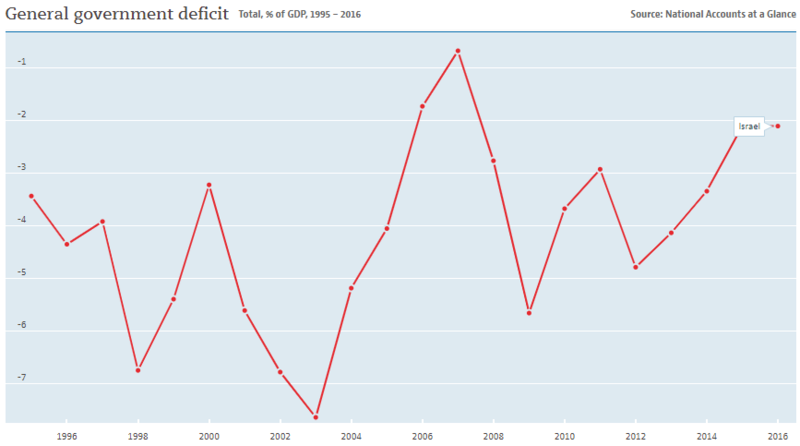 Historical data shows that the government of Israel has managed to reduce its national debt from 100% of GDP (by OECD measures) in 2003, cutting it by a quarter. Who manages Israel’s national debt? The government of Israel’s Ministry of Finance is responsible for deciding on the national budget, which also means that it decides on the increase or decrease in the national debt. The Ministry has a division, called the Debt Management Unit, which is specifically tasked with raising funds through debt. The fall in the debt to GDP ratio of Israel from 100% in 2003 down to just over 75% at the end of 2016 implies that the government ran a surplus. However, the graph below shows that the government has not produced a government surplus in any year during that period. Is Israel’s national debt rising? 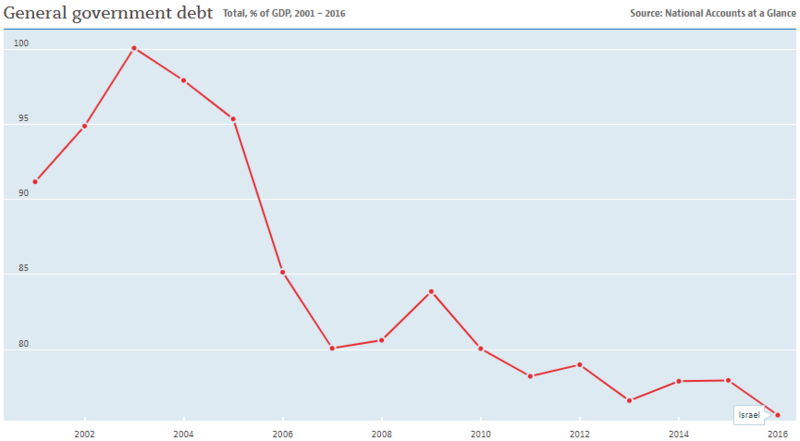 Israel’s debt to GDP ratio has fallen since 2001 without the Israeli government having to pay the debt down. This is because the country’s national income (GDP) has increased at a faster pace than debt growth. The table below with data from the Bank of Israel shows the increase of the country’s national debt while its debt to GDP ratio simultaneously falls. The phenomenon shows that government can continue to comfortably increase national debt as long as they can be sure of constant growth in GDP. How does the Israeli government raise loans? The Israeli government issues its own bonds and also raises short-term finance through Treasury bills. The Treasury bills sold by the Ministry of Finance do not pay interest, but are sold at a discount and redeemed at full face value. The Ministry uses 3-month and 1-year maturities for these devices. The fixed-rate bond is the classic benchmark bond, which pays interest at the same rate every year of its duration. The rate on floating-rate bonds is set each year by the rate given for Treasury bills. The index-linked bonds pay the same interest rate each year, but the capital value of the bond is increased each year in line with the Consumer Price Index of Israel. Bonds are usually sold by auction, which is open to pre-approved dealers. However, the Ministry of Finance does also sell bonds directly to financial institutions and large traders. The government of Israel also sometimes takes loans from foreign governments, supranational organizations, and other overseas institutions. The government of Israel frequently places bonds issued in foreign currencies with overseas financial institutions. Most of these bonds are denominated in US Dollars. Since 2003, the Israeli government has had a credit guarantee offer from the United States of America. The aim of the US Loan Guarantees Program was to make government borrowing cheaper for the Republic of Israel. This guarantee underwrites up to $3 billion of bonds and loans per year. If the full allocation is not undertaken in one year, the remaining guarantee allowance can be rolled over to following years. This guarantee facility has been repeatedly extended and currently expires in OCtober 2019. Although the USA enjoys top ratings of AAA, the benefits of this guarantee in reducing the amount of interest expected from Israel for its debt has reduced over the years as Israel has worked to improve its own credit rating. The credit ratings for Israel from the three top credit ratings agencies are shown in the table below. The Ministry of Finance used the guarantee facility for bond issues in 2003 and 2004, but has not deployed the guaranteed again. A government-approved independent body, called the Israeli Bonds Organization has been selling Israeli government bonds since 1951. The bonds that the organization sells channels loans to the government of Israel, which makes interest payments on the bonds and redeems them on maturity. The bonds are offered to overseas Jewish traders in their home currencies. These bonds are not tradeable and are held by the buyers until maturity. The Israeli Bonds Organization has raised a total of $38 billion for the government of Israel since its inception and is an important. The Organization also carries out work abroad to promote Israel as a tourist destination and as a safe place to invest. What facts should you know about Israel's national debt? You could wrap $1 bills around the Earth 841 times with the debt amount. If you lay $1 bills on top of each other they would make a pile 23,603 km, or 14,666 miles high. That's equivalent to 0.06 trips to the Moon.